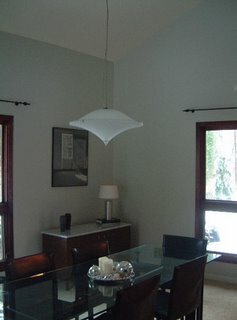 We just had the dining room painted (Benjamin Moore Titanium and Benjamin Moore White Cloud) and it looks beautiful. The painters were really impressed with the colours, too. It seems no-one had chosen them before, there seems to be a lot of magnolia, or Navajo white as it is called here, around, otherwise it's pale yellow, sage green and coffee colours: espresso, capuccino, mocha.